Whether you are already vegan or are vegan curious, this site is for you! There are seemingly countless, fantastic resources on the web on veganism. I've put together a sampling of what I have personally found to be the "best of". Enjoy! The word "vegan" originated in 1944 by Donald Watson of the Vegan Society of the UK. 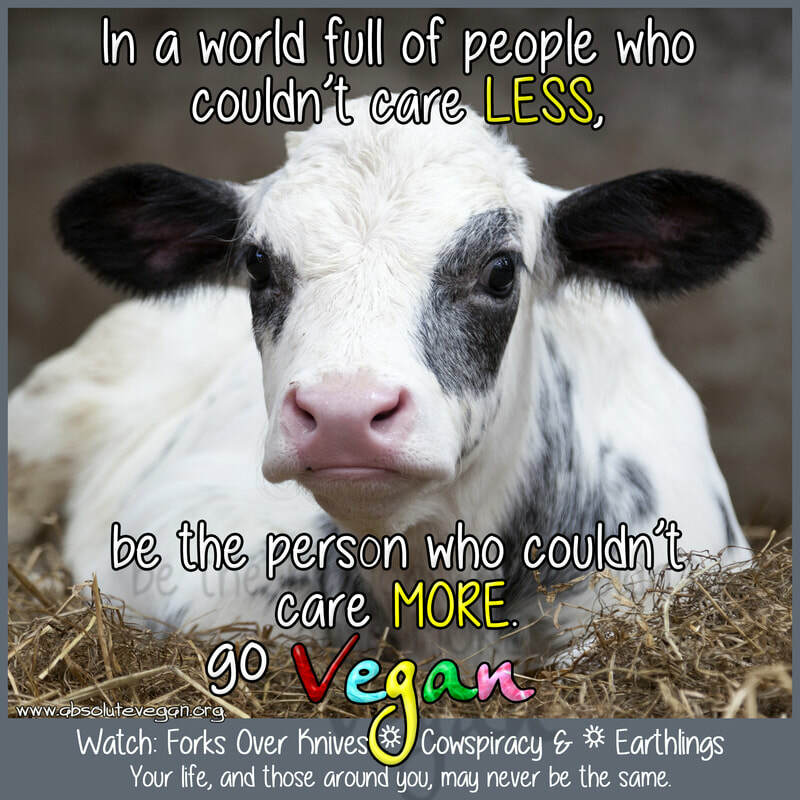 This definition states: "Veganism is a way of living that seeks to exclude, as far as possible and practicable, all forms of exploitation of, and cruelty to, animals for food, clothing and any other purpose." ​​To be clear, veganism is not defined as a diet, but a way of living. While vegans follow an animal-free diet, they also do not wear animals or use them for entertainment or any other purpose. "If you think it’s wrong to hurt animals, you already believe in veganism...When we live non-vegan, we are hurting animals unnecessarily! We are not living according to our own values nor are we respecting animals’ inherent right, as sentient beings, not to be used as resources." The Advocacy of Veganism Society (TAVS). ​It is this simple: Using animals, whether for food, clothing, entertainment, or experimentation, always results in unnecessary suffering and most often death. Fact: We can all live healthy and happy lives without using animals. So.....why wouldn't you? The short video at the top-right succinctly and unequivocally answers the question: "Why Vegan?" Please take a minute to watch. Already vegan? Want to help animals more? Could I alone, harm, torture, or kill another living being? Once examined, will my conscience allow me to have other people harm, torture, or kill another living being in my name for my frivolous use? Exploiting animals because they taste good, make fashionable garments, or are entertaining to us, is frivolous. The information presented on the website may change your life - as well as those around you! "If you think it's wrong to hurt animals, you already believe in going vegan." Vegans are Anything but Weak! Contrary to popular belief, a vegan diet is optimal for building muscle and athletic performance! "Animal rights without veganism is like human rights with slavery. It makes no sense. None whatsoever." "150 years ago, they would have thought you were absurd if you advocated for the end of slavery. 100 years ago, they would have laughed at you for suggesting that women should have the right to vote. 50 years ago, they would object to the idea of African Americans receiving equal rights under the law. 25 years ago they would have called you a pervert if you advocated for gay rights. They laugh at us now for suggesting that animal slavery be ended. Some day they won't be laughing."